Trust Battery Power Tester | OhGizmo! You know who’s really happy about all these gadgets flooding the market? Battery makers, is who. Think of it. Before the Great Gadget Age, all you ever really needed batteries for was your camera and maybe your Walkman. Now, there hardly is anything you don’t need them for. And of course, with so many of them lying around, you might have the occasional urge to know if they’re charged before you put them in your daily gadget of choice. 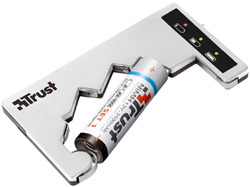 Well, company Trust is selling the PW-2050, a stylish and cheap battery power tester. It takes the most common sorts (NiMH, NiCd, alkaline and lithium) in the most common sizes (AA, AAA, C, D, N and 9V). It goes for about 10$. ahhh, I remember how back in the day the battery packages would come with little testers on them. But I haven;t had to buy batteried in awhile, everything I have uses Lithium Ion… none the less, looks like a useful item to have lying around.